Telescoping extension ladders are used in a variety of projects today—be it residential or commercial use. If you are looking for one, there are three factors that you need to consider. First, the ladder must be lightweight and portable. Second, it should be built from high-quality materials such as aluminum and steel. Third, it must be designed for heavy-duty use. With the factors above in mind, we’ve created a list of the top 10 best telescoping extension ladders that you can find in the market today. The following are the most durable, innovative, and quality telescoping extension ladders that you can buy online. First, we have the aluminum telescoping ladder from Xtend & Climb. This telescoping ladder is intended for professional use due to its easiness of retracting. The easy no pinch closure system allows you to extend and lock the ladder using the foot. It also features a built-in carrying heavy-duty handle closure strap for optimal use. You can extend the ladder height up to 15 feet and 6 inches. The legs are equipped with non-slip end caps that ensures stability while using the product. It’s also portable, only weighing 36 pounds, allowing you to carry it where the work needs to be done. Rest assured of your safety during the operation because it is ANSI and OSHA-rated. 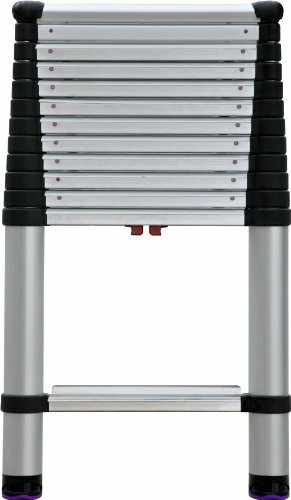 If you have extra budget, check out the Telesteps 1600EP professional wide step telescoping extension ladder. Thanks to its big size, you can have multiple heights in just one ladder to suit any projects. It also complies with the OSHA safety standards to give you peace of mind while working. There are safety indicators in every flight of the steps. This professional telescoping ladder is intended for professionals, homeowners, and contractors due to its variety of uses. It’s lightweight and easy to carry around. The compact size makes it easy to store. Made of aircraft grade aluminum alloy, this telescoping material is strong, safe, and reliable. It also features adjustable silicone feet to provide strong stability. The patented one-touch release for optimal convenience. 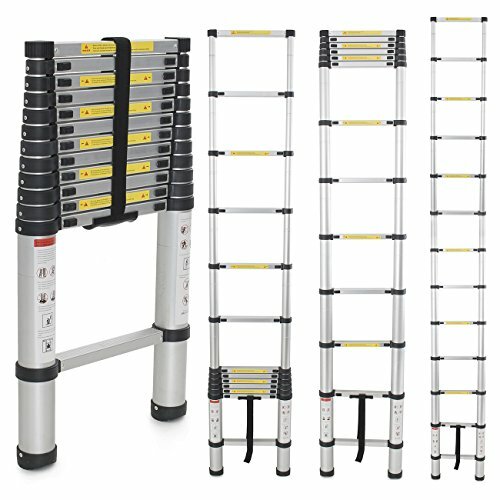 For those who are keen on durability, you should check out the WolfWise upgraded telescoping multi-purpose ladder. Every section is engineered to open and close easily and safely without risking injury to your fingers. The legs have non-slip end caps to provide great stability as you work. This ladder is designed for multi-purpose work, allowing you to unlock each section in 1-foot increment depending on your work’s requirement. The ladder is made of aluminum alloy that’s resistant to corrosion and rusting. Since it’s made of alloy, it is lightweight and can be easily stored. This ladder can also support users up to 330 pounds. The full maximum height is 15.5 feet that you can retract to a quarter for easy storage even in your car or even in limited spaces in your house. Thanks to its considerate design, you can secure the ladder close when not in use. 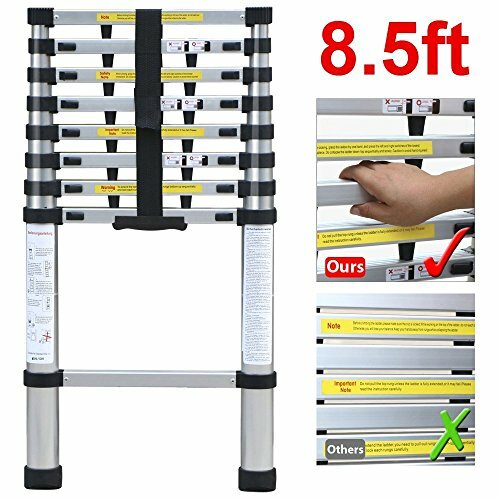 The Finether aluminum telescopic extension ladder has 12 rungs with latches that allow you to extend the ladder in your desired height. It is intended for professional use and homeowners who’d like to do repair works by themselves. The anti-slip treads and double over-molded feet provides great stability and traction when used. You can lock the latches in each ring; there are also closure straps to secure the ladder shut and avoid accidental opening. The finger protection spacers are designed to prevent the risk of finger injury while using the product. This ladder is made to last as it meets the European Safety Standard EN131 to provide optimal safety and comfort. The sturdy aluminum alloy construction makes this ladder resistant to water, corrosion, and rust. It can accommodate users weighing up to 331 pounds. Since it’s lightweight and portable, you can carry it where the work needs to be done. No assembly is required upon arrival of the product. The Generic professional aluminum extension telescopic contractor ladder is a heavy-duty tool essential for every contractor and homeowner. You can fully extend the 8.5-feet ladder to maximize and get the desired height for your work. It is made of aluminum alloy that’s lightweight and durable. This ladder is certified for European safety standard for your peace of mind. The handle of the ladder offers taking around, wide stiles, and rungs with non-slip ribbing for your safety. It also features a unique extension and locking mechanism with thumb buttons that will click with no hassle at all. The package includes a heavy-duty strap to secure the storage. 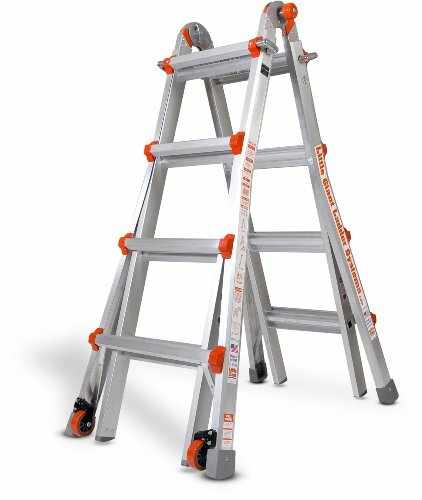 For a comfortable and easy transporting, this ladder features a hand pad. The non-slip rubber angled feet ensures that it does not leave a mark or scratches to your floor when at use. The Telesteps 14-feet reach telescoping extension ladder only weighs 18 pounds, great for carrying around. It can support up to 250 pounds of weight and easy to store. For customers who are on a tight budget, this is one of the most affordable yet durable telescopic ladders we’ve found in the market so far. The fully automatic operation up and down with patented one-touch release mechanism provides optimal convenience when using the product. The feet are capped with 100% silicone pivot for a safe and stable grip. It’s an OSHA-compliant product to give you peace of mind while using the product in a variety of projects. You don’t need to burn a hole in your pocket to have a ladder made of aircraft grade aluminum alloy for superior durability. Next, we have the multi-use ladder from Little Giant Ladder Systems. It is made of aircraft-grade aluminum featuring triple-lock hinge and wide-flared legs for your safety. Due to its high-quality construction, it delivers great stability while you are working. Up to 24 configurations including the A-frame, extension, 90-degree and three different scaffolding positions, this ladder can be used for a wide variety of repair works. 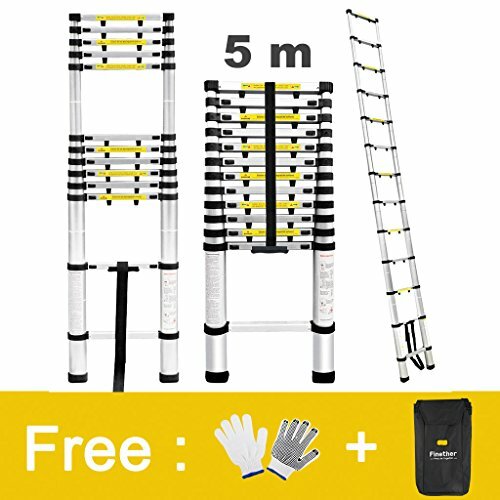 Now you can do the job of five in just one ladder. It also exceeds all ANSI and OSHA standards to give you peace of mind. 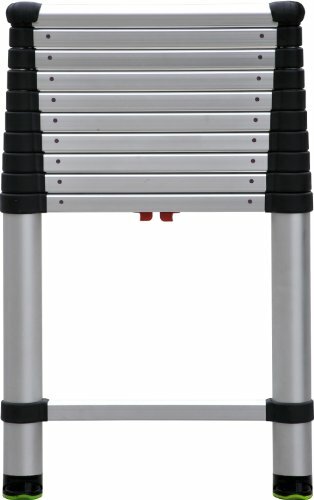 This ladder can accommodate up to 300 pounds of a user without wobbling a bit, allowing you to reach the toughest areas in your house. Thanks to its added safety features, you can prevent at least 95% of ladder-related injuries while working. The aerospace-grade aluminum is designed for heavy-duty use and can last for a long time. 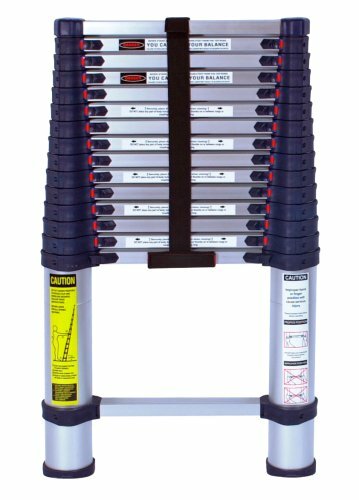 The DLT telescoping ladder is made of heavy-duty aluminum construction that can accommodate up to 300 pounds. It’s also lightweight and easy to carry around. You can extend it per 1-foot increment and can reach up to 12.5-feet. The spring-loaded locking mechanism on each rung provides safety and stability while using the product. It’s also easy to store, weighing only 26 pounds, this ladder can be placed in one of your garage cabinets. 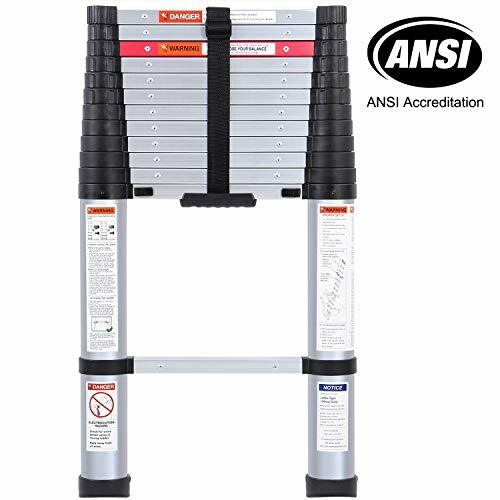 The ANSI-rated ladder is safe to use for both professional and residential use. There are also safety locks for the user’s confidence while working with the product. One good thing about this product is its affordable price. It has the same features as other ladders at a lower price, allowing you to save money in the long run. Lastly, we have the sleek-looking Telesteps 12.5-feet black tactical telescoping extension ladder. It can reach up to 16 feet, depending on the project’s height requirement. It can accommodate users weighing up to 300 pounds and used by the US military because of its safety features. The ladder also features a fully automatic operation up and down with patented one-touch release mechanism for hassle-free operation. The legs are wrapped with 100% silicone pivot to provide great stability and avoid slipping. The OSHA-compliant ladder might be a little expensive compared to other ladders we’ve reviewed, but it is superior in durability and quality. With proper use and maintenance, this ladder can serve you for many years to come.